Silver has confirmed gold’s breakout of several days ago by following suit and breaking out above important resistance on Friday on the strongest volume for almost 6 months. This means that we are now in a full on Precious Metals sector uptrend, which is still in its earliest stages. We can see silver’s decisive breakout on its 8-month chart shown below. This breakout vaulted the price above strong resistance in the $20.50 - $20.70 zone and even above its 200-day moving average. 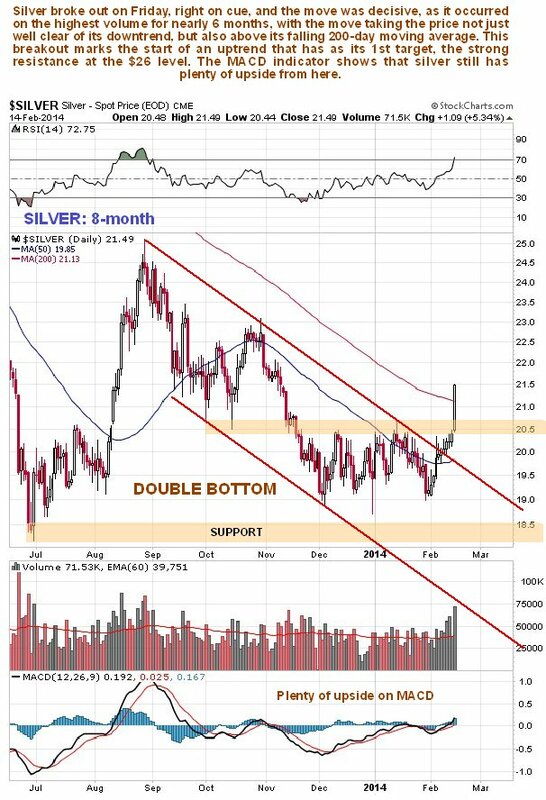 While the short-term RSI indicator shown at the top of the chart is getting into overbought territory already, the MACD indicator at the bottom of the chart, which is still not far above neutrality, makes clear that silver still has plenty of upside potential from here, and that, therefore, this nascent uptrend is still in its infancy. How far is this uptrend likely to get before it runs into trouble? – there is no serious resistance until the $26 level is reached, so that is our immediate target, and a move by silver to $26 from the current $21.50 will result in sizeable gains in leveraged silver ETFs and in many silver stocks. Once silver gets to the $26 area the strong resistance there is expected to cause it to at least pause and possibly to react, but it is not expected to ultimately stop it – this uptrend should eventually result in silver challenging its highs in the $50 area, before going on to break above the resistance near these highs and then advance towards the upper boundary of its major uptrend channel shown on the 14-year chart below, taking the price to much higher levels. A possible scenario has been drawn on the chart, and while it is unlikely to take this exact form, this scenario is considered plausible and perfectly reasonable. 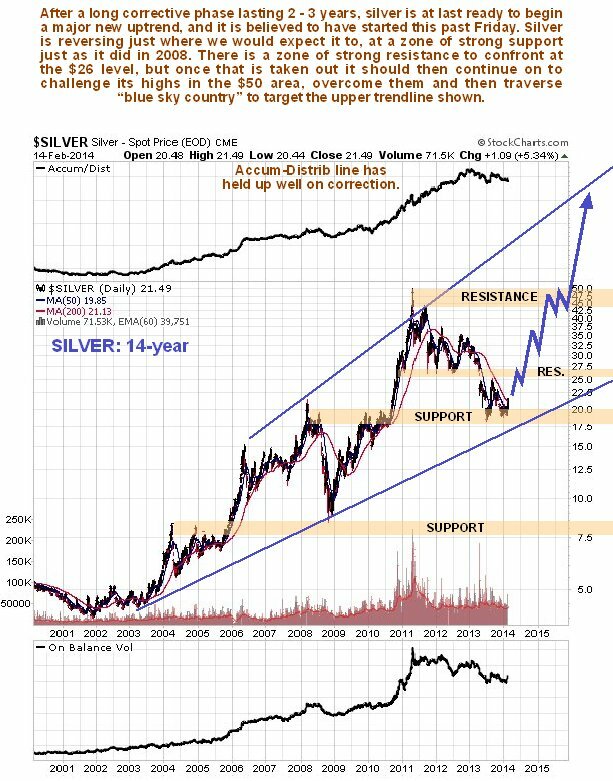 If it does pan out like this it will obviously result in huge gains for leveraged silver ETFs, and for many silver stocks, especially the quality juniors. 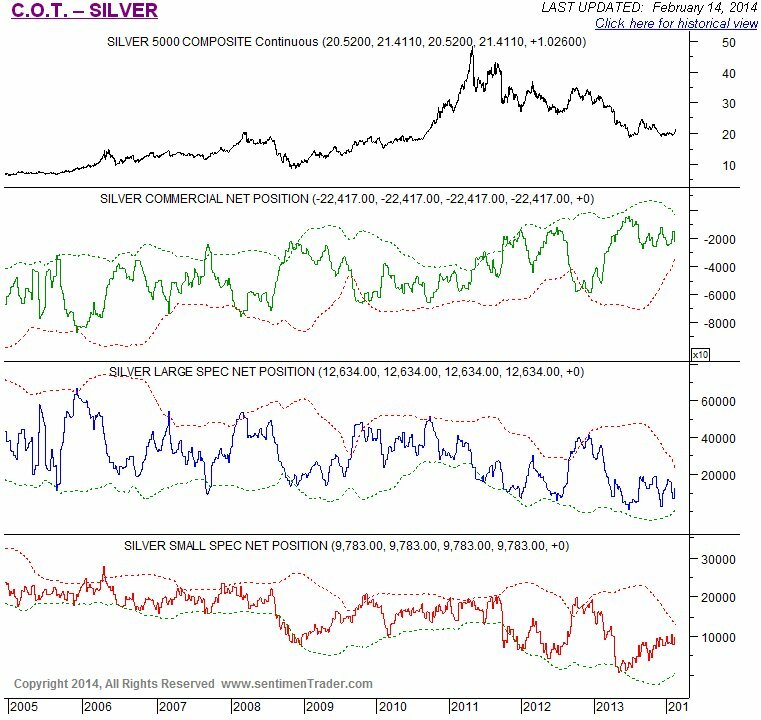 The latest COT charts for silver continue to show a bullish setup, with the Commercials still having a historically low short position, the Large Specs a low long position. 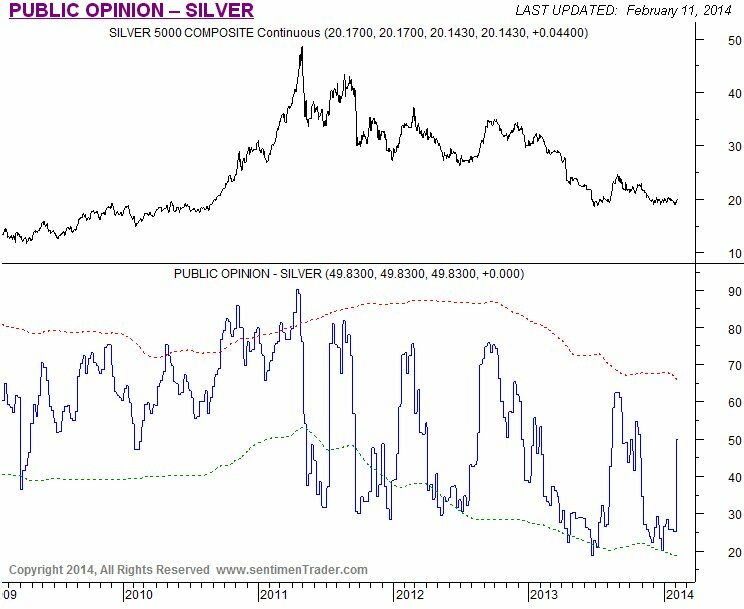 Public opinion on silver shows a dramatic surge some days back, but it is not yet at readings that would threaten to cap silver’s advance. What all this means is that pretty much everything right across the Precious Metals sector is a strong buy, with the exception of course of stocks in companies which are blighted with severe debt problems or are over-diluted etc. So you can go for silver itself, silver ETFs and the better silver stocks now with confidence.